Parents worry a lot about their children having ear infections; they think such infections are very dangerous. Accordingly, they often bring their children in to see the family doctor. In the middle of a typical Wednesday morning clinic, Mrs Green, a white, 31-year-old, married mother, brings her 3-year-old daughter, Amy, to see you. Mom says that Amy has been complaining about a pain in her left ear, and pulling at that ear, for 2 days. She has not had a cough or a runny nose, but she might have had a slight fever. Amy was born by normal vaginal delivery and has been a healthy child. Her record shows that she has been seen only twice in your clinic, once for otitis media (treated with an antibiotic) and once for abdominal pain. There is no record of hospitalization or serious illness. Amy is in the age group most likely to experience AOM, and she has a documented previous attack of AOM. Amy is white, but has no predisposing abnormal anatomical features. You do not know whether her mother smokes, whether Amy goes to day care, or whether the family is prone to ear infections. Acute otitis media is far and away the most common cause of earache in children, but you stop to consider other possibilities—mostly mild but some potentially serious: foreign body, coryza causing eustachian tube blockage, mumps, otitis externa, tender cervical nodes, temporomandibular joint pain, cervical spine pain, pharyngeal tumours, mastoiditis, meningitis, dental pain, and sinus pain. 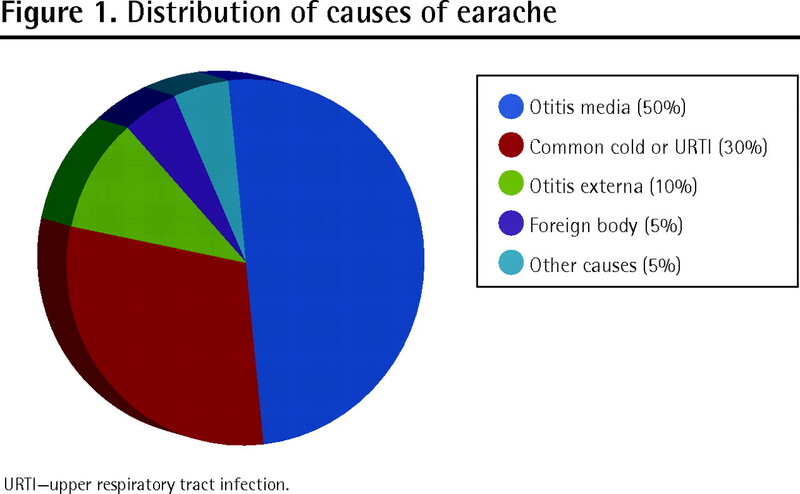 Figure 1 shows that otitis media, otitis externa, and the common cold cause most earaches in children. In primary care, other causes are rare. As Amy is an otherwise healthy child who is not taking any medications, it is likely that her earache is due to acute otitis media or an upper respiratory tract infection. Before examining her, you consider whether any alarm features are present. Amy is not known to have been in contact with any serious infectious diseases; she does not attend day care. Mom cannot think of any toy or small item that is missing, and the pain did not come on suddenly. Amy has not been unusually drowsy or had a high fever. The pain is restricted to her ear on one side. Amy has no rash, neck stiffness, or unusual drowsiness; she seems alert. Her ear is not running, and she does not look particularly ill.
You ask more questions—the mother is a non-smoker, the family is not prone to ear infections. Mrs Green says her daughter has not complained of neck, sinus, or throat pain. Amy has not vomited. Amy is quiet but is alert and looks quite well to you. Her temperature is 37.8°C; she has a runny nose; her throat looks normal, and there are no swollen neck glands. Your otoscopic examination reveals that her left tympanic membrane looks redder and less reflective than her right one, but you do not see bulging, retraction, or fluid behind the eardrum. There is no perforation or discharge. Her face, mouth, and throat look normal. Your examination reveals no foreign body. There is no swelling in front of her ears; the mastoids, temporomandibular joints, and maxillary sinuses are not tender. Her cervical glands are normal in size and are not tender. Her teeth and mouth look normal, and you notice that during the examination Amy moves her neck freely. You are now fairly confident that no serious cause of the earache is present (or at least not detectable at this stage). You are beginning to think AOM is likely. How sure of your diagnosis are you? It is difficult to confidently diagnose AOM; there is no criterion standard for diagnosis in primary care. Most studies have used a combination of symptoms and signs to diagnose AOM.6–9 As Table 16–9 shows, some features make AOM more or less likely. Your patient has an earache, a cloudy tympanic membrane, and a history of previous AOM, all of which increase the chances of AOM being present. On the other hand, her slightly raised body temperature, the presence of a cold, and the slight redness of her eardrum do not increase the chances. You decide that your young patient probably does have AOM. Now you have to think about management. The natural history of AOM has been elucidated by the experiences of thousands of placebo-group subjects in the trials of antibiotic treatment.10,11 It has been estimated that in around 80% to 85% of children with AOM, the fever and pain resolve within 2 to 3 days; after 7 days, the absence of all symptoms and signs (except for middle ear effusion) can be expected. These trials for children with AOM showed that very few treated children developed complications, but neither did those children who were given placebo.10,12 Very few suppurative complications occurred either in the placebo or intervention groups.11 Complications of AOM, such as mastoiditis and meningitis, once moderately common, are now extremely rare in developed countries. Administration of antibiotics does not prevent these complications. How many children do I have to treat for one to benefit? How many children do I have to treat to harm one? Is it safe to wait and see what happens? You advise the mother that her daughter has AOM. You tell her that it will most likely improve by itself in a day or so. You suggest that she give Amy ibuprofen to relieve the earache and return to see you in 2 days. The mother says that they will be away from town for 2 days. You provide her with a delayed prescription for amoxicillin, which she can use if required. If, despite antibiotic therapy, Amy still does not improve, Mrs Green should seek further medical advice. La traduction en français de cet article se trouve à www.cfp.ca dans la table des matières du numéro de septembre 2011 á la page e320.
. Antimicrobials for acute otitis media? A review from the International Primary care Network. BMJ 1997;315(7100):98-102.
. Epidemiology of otitis media during the first seven years in children in greater Boston: a prospective cohort study. J Infect Dis 1989;160(1):83-94.
. A meta-analytic review of the risks factors for acute otitis media. Clin Infect Dis 1996;22(6):1079-83.
. Otitis media in association with various congenital diseases. Preliminary study. Ann Otol Rhinol Laryngol Suppl 1990;148:13-6.
. Auditory disorders in Down’s syndrome. Scand Audiol Suppl 1988;30:S65-8.
. Characteristics of earache in children with acute otitis media. Am J Dis Child 1985;139(7):721-3.
. Symptoms of acute otitis media. Pediatr Infect Dis J 1998;17(8):676-9.
. Signs and symptoms predicting acute otitis media. Arch Pediatr Adolesc Med 1995;149(1):26-9.
. Predicting acute otitis media with symptoms and signs. Acta Paediatr 1995;84(1):90-2.
. Treatments for acute otitis media in children: antibiotic versus placebo. Cochrane Database Syst Rev 2004;(2):CD000219.
. Management of acute otitis media. Rockwell, MD: Agency for Healthcare Research and Quality; 2001. Evidence Report/Technology Assessment no. 15. AHRQ publication 01-E010.
. Are antibiotics indicated as initial treatment for children with acute otitis media? A meta-analysis. BMJ 1997;314(7093):1526-9.
. Acute otitis media: a new treatment strategy. Br Med J (Clin Res Ed) 1985;290(6474):1033-7.
. Guidelines for the diagnosis and treatment of AOM in children. Edmonton, AB: Alberta Clinical Practice Guidelines; 2003.
. Diagnosis and management of childhood otitis media in primary care. Edinburgh, Scotland: Scottish Intercollegiate Guidelines Network; 2003. Available from: www.sign.ac.uk. Accessed 2011 May 4.
. Short course antibiotics for acute otitis media. Cochrane Database Syst Rev 2010;(9):CD001095.
. Delayed antibiotics for respiratory infections. Cochrane Database Syst Rev 2007;(3):CD004417.